You know the Friends gang just like they’re your real friends. But how many times have Ross, Monica, Chandler, Rachel, Joey, and Pheebs gone by different names – and do you know what they were? Q: When Chandler wants to change his name to something cooler, what does he choose? 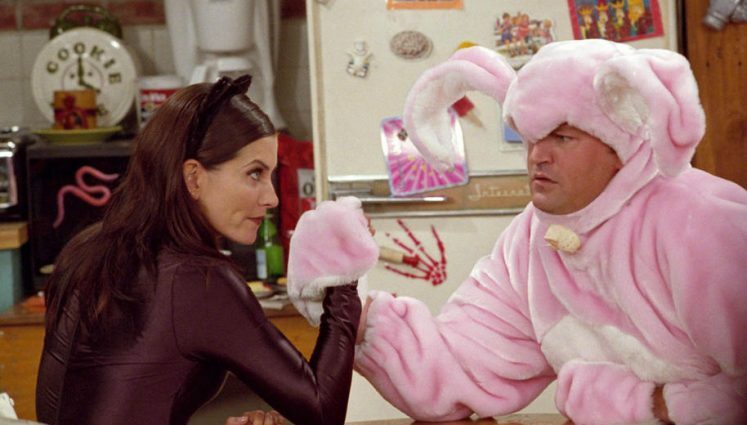 In a bid to have one of Frank and Alice’s babies named after them, Joey and Chandler start a competition in “The One with Rachel’s New Dress.” Chandler proclaims that he hates his stupid name and he’s changing it to Clint. Joey and Phoebe don’t buy it, so Pheebs offers the alternative Gene. Q: What did Monica’s father nickname her as a child? Q: When Phoebe’s engaged to Mike, she decides to change her name to Princess _______ ________ Hammock? When Phoebe discovers that she can change her name to anything she likes, instead of taking her new husband’s surname, she changes her name to Princess Consuela Banana Hammock. Don’t worry, though: Phoebe says her friends can call her Valerie. There’s no mention of where the name comes from, but insiders know that Valerie is Lisa Kudrow’s real middle name. Q: When Ross gets super angry, what does he call himself? Q: In response to Phoebe’s name change, what does her fiancé, Mike, change his name to? When Phoebe just won’t give up on being Princess Consuela Banana Hammock, Mike decides to give her a taste of her own medicine and tells her he’s changing his name to Crap Bag. When Mike says he loves Princess Consuela, she says “and I love Crap.” Matters only get worse when she has to introduce her husband to one of her massage clients by using his new name. Q: What is the name that appears on Chandler’s TV Guides? Q: What was Phoebe’s standby fake name?